What do we mean by “walkability”? Walking is widely recommended for the general adult population to promote health and well-being. For people with arthritis, walking is known to reduce pain and improve function. Walking is well recognized as a key strategy for managing arthritis. The concept of “walkability” has gained attention as a way to promote walking and physical activity. The term, “walkability,” generally refers to how well a neighborhood or location promotes walking and other physical activity behaviors, given the presence or absence of different features in an environment. Much is known about environmental features that support walking and physical activity behaviors in the general adult population including appearance or aesthetics, safety, presence of parks, social support, and more. Such features make for a highly “walkable” environment. Less is known about ‘walkability’ environmental needs for people with arthritis, the leading cause of disability among older adults. Walkability needs for people with arthritis may be similar to the general older adult population since mobility needs are similar. On the other hand, adults with arthritis have a condition that worsens over time. They also struggle with fatigue, pain, muscle weakness, and stiffness. As such, there may be some unique environmental walkability features that affect the physical activity of people with arthritis. Phase 1 objectives were to i) perform a literature search of existing walkability tools and research to identify evidence-based walkability features for community walking behaviors among people with arthritis, and ii) identify whether arthritis-focused, evidence-based features are available on existing walkability assessments. Phase 1 Conclusion: Many research studies exist that identify environmental features for walkability among the general adult population, but very few studies identified arthritis-specific environmental features for walkability. Similarly, many tools exist to assess community environments for walkability, but very few of those tools address the needs of people with arthritis or related rheumatologic conditions, specifically. 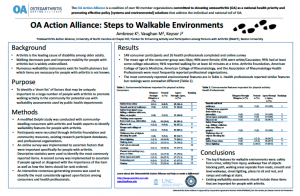 Phase 2 objective was to develop consensus around walkability environmental features most important to people with arthritis for an ‘arthritis assessment tool’ that would be used with other public health walkability assessments. Phase 2 Conclusion: A group of consumers and a group of health professionals completed online surveys to define the list of key environmental features important to people with arthritis for both walking and physical activity. 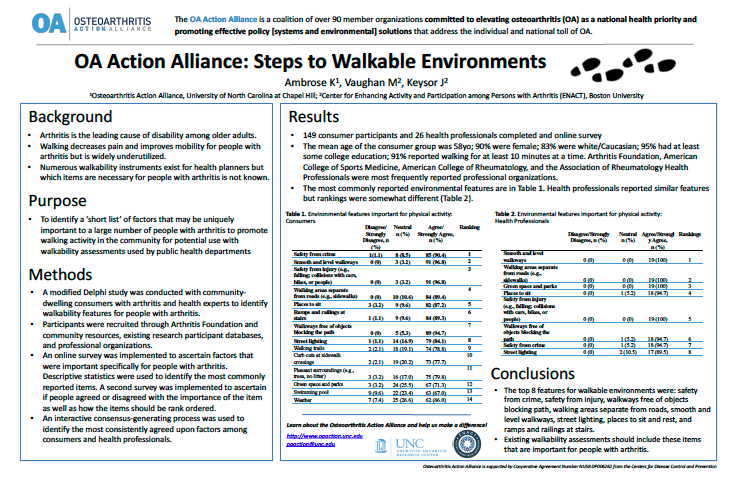 As a result, we developed a brief assessment tool with items recommended for arthritis-specific walkability. You can read a brief overview or the complete report of the Walkability Project described above and download the Arthritis Walkability Assessment. These reports and assessment tool are useful for public health providers, policymakers, community leaders and others interested in assessing and developing environments to support walking behaviors for adults with arthritis. * Dr. Keysor is now affiliated with MGH Institute of Health Professions.